Some of the most historically significant examples of the E-type Jaguar will be celebrating the model’s 50th birthday at Chelsea AutoLegends in the grounds of the Royal Hospital Chelsea on Sunday 4 September. 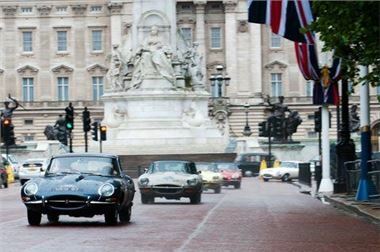 Back in the Swinging Sixties, the car was one of the trendiest icons seen on Chelsea’s ‘groovy’ Kings Road and its golden anniversary will be marked in style with what’s almost certainly the largest and most significant display of E-types ever seen in London. Among the E-types expected are early examples, racing versions and lightweight specials. Almost all are known to aficionados by their number plates. In addition E2A, the prototype that sits between the D- and E-types, will be on display along with the famous ‘Lindner/Nocker’ lightweight low drag competition car and a pair of early models, chassis numbers 24 and 84. And there will be up to a dozen other, later examples of the E-type entered by members of the public for display in a special Showgrounds area at the event. Among the men behind the E-type, one of the most famous is test development engineer Norman Dewis. Although he was involved in the inception of many Jaguars over the years, it is his role in the birth of the E-type that is probably most significant. Dewis, now aged 91, will be one of the many human stars at Chelsea AutoLegends. Now in its second year, Chelsea AutoLegends is packed with important and rarely seen competition cars. There will be displays devoted to Le Mans racers, Group B rally cars and classic bikes. Other displays will tell the ‘Made in Chelsea’ Invicta story and will relive the 1970s era of touring car racing. There will be cavalcades of supercars and motorcycles arriving at the show during the day plus a special tribute to the Mini Cooper – which, like the E-type, is 50 years old this year. The ten most significant road cars of all times, as voted by Autocar magazine (and, yes, that includes an E-type – 9600 HP) will be on official display with countless other classics in the car parks. It’s not just cars but people, too. As well as Norman Dewis, Event Patron Sir Stirling Moss OBE will be there along with multiple motorcycle World Champion Phil Read and rally hero Russell Brookes. And in keeping with the venue, just a stone’s throw from the Kings Road, and the many displays from the Swinging Sixties it is hoped that visitors will get into the spirit of the day by wearing mini skirts, kaftans and bell-bottoms and flowers in their hair. Tickets for this year’s Chelsea AutoLegends are now on sale either via the event’s new website ( www.ChelseaAutoLegends.com) or from the ticket hotline on 0844 581 0760. Advanced adult tickets are £15 (£20 on the gate) and £10 (£20 on the gate) for 12-16 year-olds. Underlining the event’s family entertainment values, accompanied children aged under 12 will be admitted free of charge. Editors’ notes: Chelsea AutoLegends – ‘Patron’ Sir Stirling Moss OBE – is staged on the South Grounds of the Royal Hospital Chelsea, on Sunday 4 September 2011. This year’s Chelsea AutoLegends builds on the huge success of last year’s inaugural show and once again will centre around a display of iconic cars that have contested the Le Mans 24 Hours, the world’s most famous motor race. Adding to the celebrations there will be a special focus on the much-loved cars of the Swinging Sixties – a decade when Chelsea’s groovy Kings Road was the hub of global fashion, design and pop music. Chelsea AutoLegends also raises funds for Chelsea Pensioners, residents of the Royal Hospital.